you are here : home > home & decor > The Carpentry Group Co., Ltd . 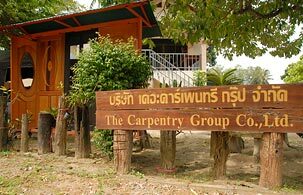 The Carpentry Group Co., Ltd .
overview of The Carpentry Group Co., Ltd . The Carpentry Group Co., Ltd . is a professional woodworking company who specialized in designing and building custom furniture for home and retail spaces. We have been delivering excellence in design and high quality craftsmanship at reasonable price for people in Phuket for over 20 years. Our factory and skilled craftsmen are dedicated to bringing you the quality work of whether it be made to order furniture, built-ins, closets, cabinets, custom doors, wainscoting, other wooden wall paneling as well as Thai style house. Carpenter repair services and consulting service are also available. furniture repairing & refinishing e.g. desks, cabinets, bed, chair etc. supply variety of timber and sheet materials for example Red Wood, Radiata Pine, Teak, Red Meranti, Persian, Merbau, Takhian sai, Iron Wood, Kempas etc. photo gallery of The Carpentry Group Co., Ltd .
map & location of The Carpentry Group Co., Ltd .